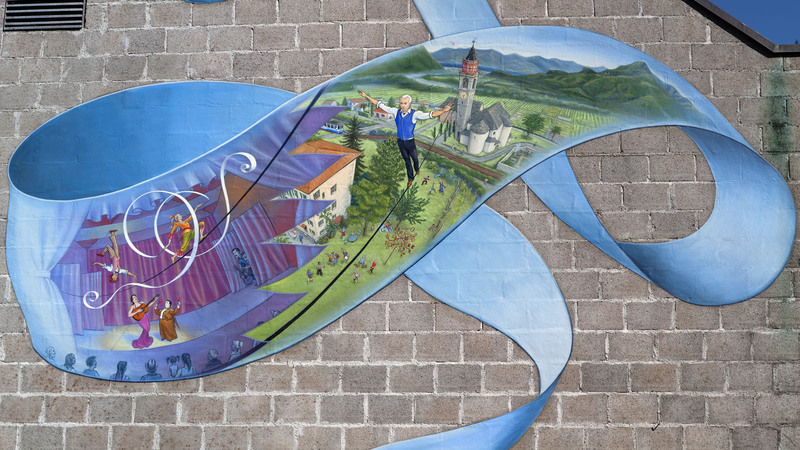 This mural is dedicated to the legendary Swiss Clown Dimitri, to his extended family of acrobatic performers and musicians, and to the Dimitri School of Physical Theater, in Switzerland. It is painted on the southern wall of the Dimitri Theater, facing the Parco Del Clown, in Verscio, Switzerland. At the bottom, Dimitri is shown performing a balancing act, holding his symbol animal, the elephant. The little elephant is in turn is holding a ribbon that contains a detailed painting of the location of the mural itself, including several of the artists who reside, perform, teach, work and study there. Scroll down to see those details! The mural shows both the inside and the outside of the Teatro Dimitri building. The outdoors scene is roughly my view from the scaffolding, plus an imagined bird's eye view of what lies beyond. I copied certain details directly, looking over my shoulder. Landmarks found in the mural: the church of Verscio, the hills above the Lago Maggiore, with a hint of the town of Locarno. The key figure holding it all together is of course Dimitri, balancing a tray with an elephant on it. David Dimitri is seen walking the tightrope from the clock tower of Verscio to the theater. Beneath him, in the park, there are several mini-portraits of performers, students and friends of the Dimitri School who were around at the time the mural was painted, including music composer Oliviero Giovannoni, and many others. From my scaffold, I took pictures of Dimitri School artists rehearsing in the park, and put them in the mural. To the left one can see what's inside the Dimitri Theater: Members of the Dimitri family are seen performing simultaneously, and old friends are sitting in the audience.